Thanks to everyone who came and visited our exhibition last weekend. We were all thrilled with the response in our first exhibition in Borris during the Borris House festival of Writing and Thinking and the Carlow Arts Festival 2014. Below is a slideshow with some images from the opening on Fri 13 June, and then images of the work exhibited. 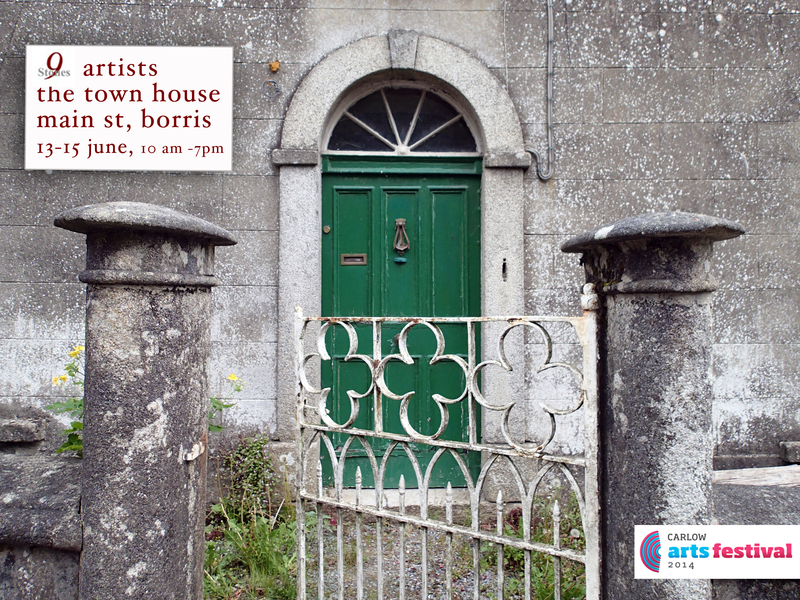 And this is what I was doing last weekend – showing some short film works with my local artists friends in Borris – Martin and I have been part of the 9 Stones Artists group since it was founded 5 years ago. It was a real treat to share our work in the area that inspires both our practices. “A common thread to the 9 Stones Artists group is that we respond to the area and reflect new meanings and experiences of South Carlow to audiences; in the various media we choose, the themes we engage with or the practices and processes we undertake. In creative ways, the 9 Stone Artists look to define and enrich understandings of the area; by examining its unique past, present and future aspirations; the geological, aesthetic, and ecological rhythms of the area and how these thread through local South Carlow life. The 9 Stones Artists was formed in 2004. Its members are professional artists all of whom are based in the foothills of the Blackstairs Mountains in South County Carlow, Ireland. The 9 Stones Artists gratefully acknowledges the generous support of Carlow County Council under the Arts Acts Grants Scheme 2011, 2012, 2014, 2015.